Is this not the most awesome watch you have ever seen? Well, that's how I feel about it at least, and when I first spotted it a couple years ago on some website or another, it was wrist lust at first site. I printed out its picture and specs, and taped it within easy view in my office at the time. 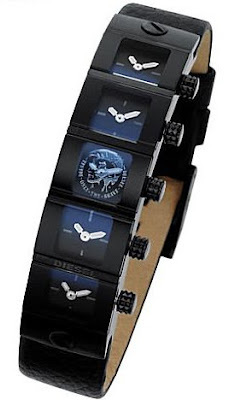 At $500, I wasn't about to run out, buy it and slap it on my wrist; no, it was a dream of ultimate multi-timezone design perfection. More an inspirational image than anything else. And then I got this boyfriend. And this guy (I'm thinking) understands or at least flatters my infatuation with international travel, and for Christmas this landed on my wrist. Granted it's been a few years, so the price has come down as the deadstock hit online auctions and such, but I doubt I still would have made the jump to buying it on my own; that's how elevated this product had become in my psyche. The good news is that it's everything I ever dreamed it would be; it blends so well with my style and is shockingly more understated than my other watches, a Turin Olympics-edition Swatch and a concrete grey Alessi piece with a dead battery. And the even better news is that now I have a little connection to New York City, London, Dubai, Hong Kong and Los Angeles--the cities I chose to occupy the five faces--on my wrist, instead of declaring allegiance to just one. It's the best aspirational product ever. that does look like a cool watch, though I'd fear I forget which 1 was set to local time.